Dip into Nassau's beautiful waters to catch a glimpse of the spectacular coral reefs hidden just below the surface. 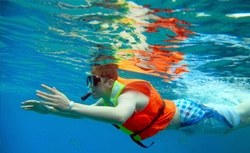 Snorkeling provides access to this unforgettable underwater world without the difficulty and training necessary for full on scuba. Pearl Island just plain lousy. After a fairly long bus ride (maybe 30 to 40 min) we arrived at Stewart Cove's. Went to Rainbow Reef? The water was exceptionally choppy, but in the 15 years that we have been travelling to the Caribbean, it was the best viewing of variety and quantity of sea life we have seen! Did a 3-hour snorkeling excursion through a third-party vendor. Rainbow Reef snorkel was awesome! Rainbow Reef snorkel was awesome! One of the best snorkeling trips we’ve done. So many fish and colorful coral! Pearl island. Snorkeling great. Management sketchy. Very windy there, and on the way back the boat stopped, with 61 aboard, to let some one off to get a souvenir. We waited for the , all 62 of us. We took the Yacht Turtle Snorkeling Tour. We took the Yacht Turtle Snorkeling Tour. Captain Eddie and his crew were great! We saw sea turtles and lots of fish while snorkeling! The weather was perfect and the water was crystal clear. The weather was against us, but they still took us out. I hate to give it a poor, it rained the whole time. Well run activity. Unfortunately it was very windy which made it challenging getting in and out of the water from the back of the snorkel boat. We did Rainbow Reef. It was less then the Seahorse and the Seahorse showed up at very same location after us. Pearl Island - lunch and snorkeling - great day! Great sail out for 30 -45 minutes. basic catamaran with one bathroom closed. Long boat ride out to Athol Island and it was in deeper waters. Long boat ride out to Athol Island and it was in deeper waters. Not for the beginner snorkeler. Actual snorkeling time was only 30-40 minutes. Seahorse Sail and Snorkel. Worth it!! Nice boat, nice crew, nice spot to snorkel. Crew was great, but Rainbow fish reef barely had any fish and the cruise line told us towels would be provided by the excursion which was a lie. It was very chilly and we had no towels.